Cable & Wireless changed their flag to blue with a white "digital" world globe. In 1969 the General Post Office, a government department, became a government-owned public corporation and was separated into two divisions, Posts and Telecoms. The cable ships went to Telecoms. In 1981 Telecoms was privatised as British Telecoms. In 1994 the cable ships were sold to Cable & Wireless. In 1999 the marine division of Cable & Wireless was sold to Global Crossing Inc. and became part of Global Marine Systems Ltd. Only those ships that were originally owned by British Telecoms, CS's Sovereign, Iris and Monarch, are permitted to wear the defaced Blue Ensign. All other British registered GMS ships wear the Red Ensign. The badge shows an hour glass in the hand of Old Father Time, being shattered by an electrical discharge. The ensign was originally granted for the cable ships of the General Post Office on 22 January 1877. From the website of the National Maritime Museum, "the house flag of Cable and Wireless (Marine) Ltd, London. A blue flag with a yellow motif of an arrow circling a globe. The flag is made of a synthetic fibre bunting with the device appliquéd in nylon fabric. It has a cotton hoist and a rope and wooden toggle is attached. The Imperial wireless and cable conference of 1928 recommended the foundation of a holding company and an operating company combining wireless and cable interests, in order to keep the strategically important but unprofitable undersea cables in British hands. This was achieved through a merger of the communications interests of the cable companies and Marconi. The resulting company began as Imperial and International Communications Ltd but changed its name to Cable and Wireless Ltd in 1934. The Cable and Wireless Marine Service originated in the cable laying and repairing activities of the original telegraph companies. IN 1934, IMPERIAL and International Communications, formerly the Eastern Telegraph Company, became Cable & Wireless. The new name was designed to more clearly reflect the combined radio and cable services which it offered, without reference to the Empire. (http://www.cwhistory.com/history/html/CableWire.html) . The flag shown is a yellow fimbriated red cross on a dark blue field, with a Tudor crown in the canton, and C & W in yellow in the lower fly. This company was known as Cairns, Noble & Co. in the 1950's. Cairn Line of Steamships Ltd. This flag is actually that of William Thomson & Sons who were, according to Talbot-Booth, absorbed around 1891 and then purchased in 1907 which sounds rather back to front. They themselves originated in 1833 as Cairns & Young which had a red flag with a white delta triangle bearing the intertwined black letters "CY" [see image below], the triangle being a symbolic "cairn". They then became Cairns, Young & Noble in 1892 and it is from around this time that they became known as the Cairn Line of Steamships using the previous flag minus the lettering. Both the Cairns and the Thomson flag were used from 1907 and then in 1928 the company was taken over by Furness Withy and it appears that this saw the official formation of the Cairn Line of Steamship Ltd. to operate the shipping under the quartered Thomson flag although sources note that the old Cairn flag was still to be sighted on occasions. This one is a triangular flag, red, with a black triangular stripe along the top and a yellow disc charged with a red something vaguely looking like a bear. I’ve a copy of their brochure in front of me — the animal is a lion, a rather chubby one granted, but a lion all the same. Caledonian MacBrayne, Hebridean & Clyde Ferries. As John states the animal is derived from the Scottish lion rampant although apparently the tail was altered from a "waving" position to one "close to the back" in order to fit into the disc. The black edging at the top is unusual but possibly it is meant to be line with the funnel which is red bearing the emblem and has a black top. The company was formed in 1973 by the merger of the Caledonian Steam Packet Co. Ltd. and David MacBrayne Ltd. The Caledonian SP Co. was formed in 1889 and had a "navy" yellow pennant bearing the red lion rampant. David MacBrayne Ltd., with origins dating from 1851, used a blue pennant with overlapping saltires of red over white with sources of the latter varying as to the amount of field which the saltires occupied with some squashing them up into the first 1/3 or so of the flag. The original flag of the new company combined the two by moving the saltires towards the fly and placing the yellow disc with the lion in the hoist. I get the impression that the change to the current flag occurred in the early 1990s. Duncan Haws includes it in his 1994 Merchant Fleets No. 26 but does not show the upper black edging and he also shows the lion as guardant. As he also shows this for the funnel and photos prove that is not the case, I have my reservations although his version may have resulted from a proposal. One point of uncertainty that I have with all these flags is their proportions with sources tending to show them as in a more triangular format whereas the early flags, especially, may have been long and narrow pennants. David MacBrayne was one of three partners in David Hutcheson's company and eventually took exclusive control in 1879 after the retirement of David Hutcheson in 1876 and Alexander Hutcheson in 1878. MacBrayne died in 1907, aged 92, having worked up until the previous year, by which time the operation had become David MacBrayne Ltd. It was reconstructed in 1928 as David MacBrayne (1928) Ltd, owned jointly by Coast Lines Ltd and the LMS railway. As David MacBrayne Ltd from 1934, 50 percent remained with the private Coast Lines Ltd until it was purchased by the Scottish Transport Group in 1969 and on January 1, 1973 was merged with STG's other subsidiary, the Caledonian Steam Packet Company to form Caledonian - MacBrayne. MacBrayne's territory was the Western Isles with Oban as base, but a regular service was run from Glasgow (later Gourock) to Tarbet and Ardrishaig on Loch Fyne for delivering mail and passengers for onward connections to the Western Isles. Marketed since the 19th century as the "Royal Route" with reference to an earlier visit to the area by Queen Victoria, MacBraynes ran some well-known, well-loved and long-lived steamers on the Clyde until the end of the 1969 season when the diesel-electric vessel Lochfyne was withdrawn. Dark blue with a white oval centered bordered in a weird shade of purple/brown and charged with the sillouette of a camel facing the hoist in dark gold. The (a?) historical flag of this company: White with an outline of a camel centered and facing the fly and the initials "CL&Co" below the camel, all in red. Many shipbuilding companies also have their own House Flags. Such a flag is displayed, along with that of the prospective owners, while a vessel is being launched. It may also be flown during her trials, to be replaced, as soon as these are satisfactorily completed, by that of the owners to signify that she has changed hands. ... that of Cammell Laird and Co. is an amusing example of punning heraldry. Operated ships along the British coast. "Flags and Funnels of the British and Commonwealth Merchant Fleets" shows slight differences: a couped chevron, i.e., with blue (background) gaps between it and the edge. Capper, Alexander Ltd. lost all 13 of their ships during WW2, and were taken over by Houlder Line Ltd. after the war. Their house flag was the "busy bee" - blue background with a golden bee in the centre. Capper, Alexander Ltd. 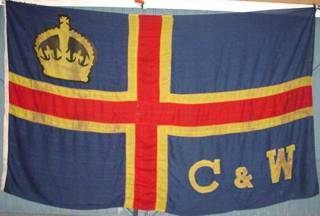 The flag was originally that of E.H. Capper & Co. of Cardiff who dated from 1875 and later became Capper, Alexander & Co. In 1914 they formed the Alexander Shipping Co. Ltd. and operated under that name with the flag. Capper, Alexander became a public company around 1937 when Houlder Bros & Co. Ltd. took a large interest and full control post WW2 continuing to operate the Alexander Shipping Co. Ltd. and fly the flag inferior to that of the Houlder Line. This lasted until around the early 1980s when they seem to have ceased as shipowners although the company itself was not wound up until 1990. Carmet Tug Co., Ltd., Liverpool - horizontal blue-white-blue; in center bright blue shield charged with a white dolphin, black "CM". Carisbrooke shipping plc., Cowes - blue flag, yellow "CS". (See also Carisbrooke Shipping, Netherlands). The Carron Company, Carron - red flag with the company seal in the center. The Carron Company was on the Clyde river in Scotland, producing guns, ammunition, etc. sides, but this version shows the lettering more plainly and the design of a phoenix rising from crossed carronades over a pile of a cannon balls. It is also supported by the version shown by Fenton and Clarkson in their "British Shipping Fleets". Ships also had a cannon ball attached to the mainmast head from the time of the Crimean War originally to signify they were carrying munitions. The company itself dated from 1759 gaining a Royal Charter in 1773 and apart from munitions apparently achieved fame with their cast-iron baths developed in 1866. The company was dissolved in 1983. Lloyds 1904 differ slightly again by making the base inscription "CARRON COY". Then from 1909 onwards the sources shown are like the scan from Lloyds although the original flag as mentioned by Talbot-Booth in 1944 and shown by Fenton & Clarkson does note that the flag was at one time merely white with a red border and such a flag is shown by Reed 1891 for Carron Steamship Co., which had been taken over by them around 1782, [see image below] although the timing of Reed seems rather out as I get the impression that the red flag with seal had been adopted about the mid 1850s. In 1862 Donald Currie, a Scottish engineer who had worked for Cunard and already possessed a controlling interest in a few other shipping companies, set up a firm of his own: Donald Currie and Co. Sailing from Liverpool to India and introducing a novelty, fixed schedules, the firm quickly made its mark. As the ships were named after famous castles, it was only natural that the company would become known as the Castle Line and the ships as Currie’s Calcutta Castles. The opening of the Suez Canal (1869) had a negative impact on the India routes via the Cape but the failure of a competitor, the Cape & Natal Steam Navigation Co., enabled Currie to have new ships sail to South Africa rather than to India. Important years were 1872, which saw the launching of the first steamship, and 1876 when the mail contract to South Africa (together, as we have seen, with Union Steamship) was awarded. In the same year the company had been reorganized as Castle Mail Packet Co.; it was to go public in 1881. As a member of Parliament, Castle’s owner – Sir Donald by now – proposed the introduction of armed merchant cruisers which was a new and radical idea at the time. How the South African mail contract was renewed and Union-Castle founded (1900).